A lot of medical students are familiar with the term “evidence based practice” or “evidence based medicine.” It’s a big part of why we’re so inclined to question statistics or seek additional research. Where’s the proof? At Picmonic, we support evidence based learning. Why would we spend our precious time studying a certain way if we don’t have any proof that it works? We know what doesn’t work. Any student, at any school, in any grade level, in any class knows what doesn’t work when it comes to studying. We know how to cram and how to memorize a few vocab words 10 minutes before a quiz. We know how to come up with quick acronym-mnemonics to memorize formulas and regurgitate them on the test. And we also know that next week, next month, next semester, we’re probably not going to remember any of it. You can see why this is daunting in medical education? As future physicians, we actually want to remember all this important information forever. And yet much of it escapes the depths of our minds. All of our own experiences and evidence point to the fact that our memories are finicky, what will stick and what won’t? We don’t want to draw a blank when it matters most, when patient’s lives are on the line. What does the research say? And what is the Picmonic response? When you close your eyes do you see vivid images or reams of text? It’s easy to get lost in the monotony of Times New Roman or Arial as we perform the torturous process of rote memorization. We even find ourselves highlighting our homework as we desperately seek change, but nothing spices up the learning experience like actually visualizing what you are writing about. We are all visual learners to an extent, it only makes sense that as we engage more of our senses in the learning experience we form deeper connections that allow us to remember information better. Paivio1,2 has attributed this effect to his hypothesis that pictures are encoded in the memory as both pictures and words, thus giving pictures an advantage to plain text. This effect has been demonstrated in young people1,2 and older adults3. Further, it is believed that pictures allow for richer stimulus encoding than words and superior retrieval processes4. What does this mean? It means that when you put your own clean clothes away and actually put your underwear in the underwear drawer, you be able to retrieve it faster when you go looking for it; rather than digging through piles of sheets, shirts and socks. Get the picture? Now, getting back to limitations. Some studies have questioned the effectiveness of the keyword method (a type of verbal mnemonic) in delayed retention7,8,9. Picmonic overcomes this by utilizing reconstructive elaborations that feature visual mnemonics at its core and take advantage of all of the other mnemonic techniques as well. Visual mnemonics are proven to assist in reducing forgetting and have been demonstrated to be superior to verbal mnemonics in this area.5 With our unique approach to utilizing every mnemonic technique in the book and even traditional text-based information, is anything better? Okay so you remember something for longer, but what good is it if you can’t score better on your test? Wouldn’t it be nice to live in a world where there were no tests? Snap out of that dream; tests are sticking around whether we like them or not. They are a way to evaluate not just that we possess knowledge, but that we know how to apply that knowledge more practically. The studies are clear on this as well. Levin and Levin10 studied verbal mnemonics and showed that, with them, students scored better on speeded true-false tests, taxonomy construction and analogy construction. Rummel, Levin and Woodward11 used visual mnemonics and tasked students with applying the knowledge obtained through study by writing an essay, a task that involves high-level thinking and consolidation of information. They found that students that had been mnemonically instructed got more of their facts correct than those that used traditional text-based materials. Further, the former’s structural coherence remained intact as well. 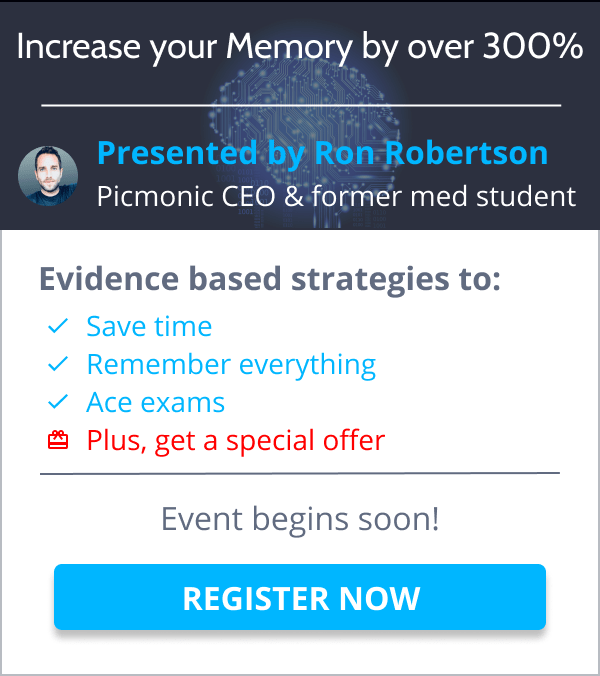 Picmonic will help you do better on your tests, and maybe one day when you are a real doctor it will help you remember that one fact that will save a life. There are certain words and things that you just won’t forget. They are terms you use in your daily life, objects you see and actions you do. Picmonic connects unfamiliar medical terms with familiar ones and then takes it to another level by sprinkling in humor, wittiness and maybe a little ridiculousness (Penicillin = pencil villain). There is no doubting that memory is heavily influenced by prior experience and existing knowledge and that leveraging this foundation in the acquisition of new knowledge helps you remember the new knowledge better12,16,17. Picmonic gives you a story in each of its cards, and with this story, you attain structural recall cues that allow you to better organize the information and thus better recall it when necessary.18 One example of this notion of context is that spatial cues can help you remember even when you don’t realize it. Imagine you forget where you left your keys. The first piece of advice you follow is to “retrace your footsteps” in hopes that a spatial cue will trigger the memory of where the keys were left. Try it on your own, imagine a vivid story in your mind that incorporates an area you are familiar with like your home and your to-do list. Let’s say you need to buy milk, call your friend Ryan, and email your boss Marilyn. Imagine yourself walking up your driveway and spotting a Holstein cow at the top of the stairs blocking your entrance. As you look down you see a puddle of milk (get milk!). Once you get inside you see something even more bizarre, a rhino is standing by the fireplace talking on your phone (call Ryan!). As you enter your office there is Marilyn Monroe in a white dress sitting at your computer typing away on an email (email Marilyn!). Access the memory a few times to lock it down and see if you remember your to-do list a week later. I am betting you will. Picmonic gives you a head start Picmonic takes full advantage of all of these research-proven memory characteristics and makes learning fun again. Many of us have never used these techniques before and there is undoubtedly a learning curve associated with taking fuller advantage of our visual memory. Picmonic provides a huge boost because the images and mnemonics are already created by a team of experts. Learners like you can save precious time and simultaneously get more exposure to using visual mnemonics so you can become better and faster at creating your own. When it comes time to access that memory at the crucial moment, you will deliver. 1Paivio A, Rogers TB, Smythe PC. Why are pictures easier to recall than words? Psychonomic Science. 1968 ; 11(4):137-138 2Paivio A. Imagery and verbal processes. Oxford, England: Holt, Rinehart & Winston; 1971. 596p. 3Park DC, Puglisi JT, Sovacool M. Memory for pictures, words, and spatial location in older adults: evidence for pictorial superiority. J Gerontol. 1983 Sep;38(5):582-8. PubMed PMID: 6886314. 4Weldon MS, Roediger HL. Altering retrieval demands reverses the picture superiority effect. Memory & Cognition. 1987 ; 15(2):269-280. 5Carney RN, Levin JR. Fading Mnemonic Memories: Here’s Looking Anew, Again! Contemp Educ Psychol. 2000 Oct;25(4):499-508. 6Scruggs TE, Mastropieri MA, Berkeley SL, Marshak L. Mnemonic Strategies: Evidence-Based Practice and Practice-Based Evidence. Intervention in School and Clinic. 2010 October 22; 46(2):79-86. 7Wang AY, Thomas MH. The effects of keywords on long-term retention: Help or hindrance. Journal of Educational Psychology. 1995 ; 87(3):468-475. 8Wang AY, Thomas MH, Inzana CM, Primicerio LJ. Long-term retention under conditions of intentional learning and the keyword mnemonic. Bulletin of the Psychonomic Society. 1993 ; 31(6):545-547. 9Wang AY, Thomas MH, Ouellette JA. The keyword mnemonic and retention of second-language vocabulary words. Journal of Educational Psychology. 1992 ; 84(4):520-528. 10Levin ME, Levin JR. Scientific Mnemonomies: Methods for Maximizing More Than Memory. American Educational Research Journal. 1990 ; 27(301-321). 11Rummel N, Levin JR, Woodward MM. Do Pictorial Mnemonic Text-Learning Aids Give Students Something Worth Writing About? Journal of Educational Psychology. 2003 ; 95(2):327-334. 12Levin JR. Thinking about and with memory strategies. Annual meeting of the American Educational Research Association; 1988; New Orleans, LA, USA. 13Carney RN, Levin JR. Delayed mnemonic benefits for a combined pegword–keyword strategy, time after time, rhyme after rhyme. Applied Cognitive Psychology. 2011 ; 25(2):204–211. 14Levin ME, Levin JR. Scientific Mnemonomies: Methods for Maximizing More Than Memory. American Educational Research Journal. 1990 ; 27(301-321). 15Soemer A, Schwan S. Visual mnemonics for language learning: Static pictures versus animated morphs. Journal of Educational Psychology. 2012 ; 104(3):565-579. 16Rohwer Jr W, Thomas J. Imagery and related mnemonic processes: Theories, individual differences, and applications. New York: Springer; 1987. Chapter 20, The Role of Mnemonic Strategies in Study Effectiveness; p.428-450. 17van Kesteren MT, Ruiter DJ, Fernández G, Henson RN. How schema and novelty augment memory formation. Trends Neurosci. 2012 Apr;35(4):211-9. 18Santa JL, Ruskin AB, Snuttjer D, Baker L. Retrieval in cued recall. Mem Cognit. 1975 May;3(3):341-8.